Basic principles apply to practicing all movements of TCC. We become more aware of and open to these principles as we practice and explore TCC. Like any learning, when you think you have learned something, you may find that yourself off course, needing to re-touch the basics, the underlying principles. That experience applies as much to TCC as it does to golf, cooking, selling, plumbing, healing, or any practice worth effort. A quick summary is shown below. Your TCC teacher will discuss these with you. 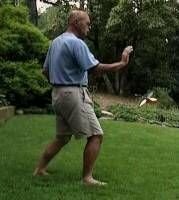 T’ai Chi Chih® is not an exercise - Practicing T’ai Chi Chih® affects the body and mind, but it is not exercise like aerobic or anaerobic exercises. Often after practicing TCC, students feel both relaxed and energized. If you are not used to practicing T’ai Chi Chih®, you may find that specific muscle groups may be stimulated and challenged, such as the thigh muscles. Some issues may be due to incorrect execution, but sometimes it just takes a little getting used to. Still, in TCC we are not “exercising”, we are circulating and balancing Chi. You will feel the difference. Students often comment on how practicing TCC alleviates physical issues experienced with forms of exercise. Move softly, gently - Use the “effort of no effort”. I have heard that the Chinese term is Wu Wei (pronounced “woo way”), which just sounds like no effort. We do not use force in our movement. The more softly we practice, the more benefit we receive from Chi flowing smoothly and balancing in our bodies. The flow of Chi is blocked by tension, by tightness. Move slowly and gently, and allow softness to prevail. Move with continuity - Our body flows in continuous motion as we practice each movement. We move slowly, lightly, smoothly, and continuously until we have completed the repetitions for a set. Then, pause to allow Chi to balance before the next set of continuous movement. Tension, Posture, Flexibility - Our physical posture and method of moving affects what we receive from practice. Move at ease, without tension, slowly, softly, and continuously within each movement, pausing between movements to allow the Chi to balance. Hands should be held loosely, without tension, fingers spread, lightly cupped. Wrists are held loosely, without stiffness, able to flex easily. The wrists, hands, and fingers are more involved in TCC than the arms. Elbows are generally close to the side of the body, though not rigidly so. There is no need to fully extend arms in any TCC movement. Maintain an upright posture from the waist upward. There is no leaning at the waist in any direction. Students feeling lower back pain should check posture to insure they are not leaning either backward, forward, or to either side during TCC movements. Body and arms move through only the slightest of resistance, as if moving through heavy air. See how loose, how tension-less and soft you can move. Remain flexible, fluid in movement. Pause between movements in the resting position, allowing Chi to balance. Knees are bent, hands rest lightly at our sides, eyes are open, and breathe with no special effort. Forward and backward weight shifts move body weight from one substantial leg to the unsubstantial, and back. Knees are bent, never stiff. When moving forward, the heel of the trailing foot will rise until the leg is grounded on the ball of the foot, but not as far as on the toes. The arms and body move at the same time so, the body does not strongly lead the arms, and the arms do not lead the body. Shift the weight slowly to allow for coordinated movement. While it is great to learn all, practicing even some of the movements on a regular basis is what is important. If you find a movement is difficult to master, work with your teacher to assess your movement. If physically unable to execute, don't worry with it, move on to the other movements that bring you benefit. As a TCC student, practice movements within your range of ability. Applying the principles - Applying the principles listed above helps us benefit the most from practice. Below are five steps I remind my students at each class to help embody these principles in our practice. First, relax, calm down. TCC teacher, Diane See, wrote a short book called Relax, Breathe, Smile. Her title captures this spirit. While all the TCC movements help you to do this, the first two movements, Rocking Motion and Bird Flaps Its Wings are especially powerful in helping you to transition into your practice. As you settle into your TCC practice, focus thought on the energy center (T'an Tien), the grounding of your soles of the feet, and allow yourself to release any thoughts, negative or positive. If your mind begins to wander during practice, return your focus to the soles of your feet and the energy centered at the T'an Tien. Second, think in terms of effort of no effort. No exertion is required. If you feel tension, release it, let it go. If you feel discomfort, return to the resting position or begin another movement, flowing softly, allowing your Chi to move and move you. Third, consistent movement is in order. Softness, slowness, continuity...all these are key and more easily experienced if we use consistency in our movement, moving with the same ease, same speed, same circularity in our movements. Fourth, practice properly. TCC teachers advise you to practice intently, never in a slipshod fashion. Even if “just showing” someone what a movement may look like, execute the movement properly, with attention to detail. When finishing a practice, be open to comment or question from another teacher or student. Let your effort be worthy of the time you invest. Without being clingy, or needy, do your best. Fifth, keep it up. Practice regularly. Every day, same time is helpful, same practice is good. When you miss your time, come back to it later. When you miss a day, come back to it as soon as you can. Consistency is best, activity is better than no activity.